At a town hall meeting last week, Rep. Chris Gibson (R-NY) faced the ire of constituents who are upset about this tax dodging by some of our nation’s biggest corporations. AUDIENCE MEMBER: You mean like GE?! [some laughter and light applause from audience. GIBSON: Well, GE needs to pay their fair share, too. No, I support that, too. “I support that, too” – yeah, right! NASHVILLE — The tax system collects its due, even from a class of workers with little likelihood of claiming a refund and no hope of drawing a Social Security check. 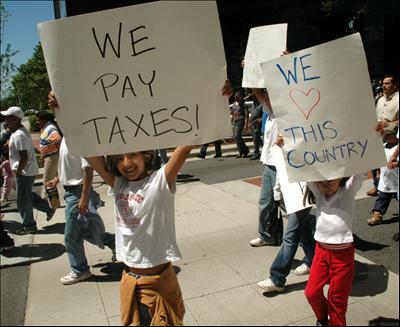 Illegal immigrants are paying taxes to Uncle Sam, experts agree. Just how much they pay is hard to determine because the federal government doesn’t fully tally it. But the latest figures available indicate it will amount to billions of dollars in federal income, Social Security and Medicare taxes this year. One rough estimate puts the amount of SOCIAL SEURITY TAXES alone at around $9 BILLION per year. He calculates that illegal immigrants contributed $428 billion dollars to the nation’s $13.6 trillion gross domestic product in 2006. That number assumes illegal immigrants are 30% less productive than other workers. “If anything we need more immigrants coming into the country, not less, especially with the baby boomers retiring,” he said.